I found my way here because of an email from Steve Lindsey. I'm a knifemaker from way back, but became interested in coinmaking about eight years ago and that hobby has now gotten entirely out of hand! I scanned the forums here and the only topics addressing coins were those talking about carving or engraving ON coins. I'm interested in engraving the dies used to MAKE coins. My particular thematic interest is fantasy coins... that is... coins that are from fantasy, fictional, or mythical places... like Camelot or Middle-Earth etc. In pursuing this interest I have been exposed to many techniques used over the centuries to create coin dies. Aside from engraving there is also etching, punching, milling, and hobbing. Each has their place depending on the type of piece being created. The idea is to use the same techniques that would have been used in the time period being emulated. As you can see I have become rather enamored of old presses. I consider myself very much a beginner at engraving. I have personally engraved only a few of the die sets I use. Master die engraver Greg Franck-Weiby has done most of them. I also have hobbed dies from master hubs engraved by Ron Landis and Stan Pearson... two of the top die engravers. Here's a fantasy Leif Eiricsson silver penny made on dies engraved in 10th century style by Greg Franck-Weiby. Perhaps I merely have missed the threads talking about engraving coin dies... but if not, I would think that it would be something very interesting to many people here. The idea is that you can lavish your work upon a tiny space... then create thousands of extremely precise renditions of that art which can be sold at very reasonable prices. Coins... medals... flatware... belt-buckles... and all manner of other presswork all depend on die-makers. It is a trade that is fading with the advent of computer controlled machining. And of course, there's a lot of really awful work out there coming from overseas. There is a terrible dearth of diesinkers in this country right now. I now have a collection of eight presses, from 5 ton to 320 ton capacity... and several thousand antique dies and hubs. It's been a marvelous education to study the old dies made the old way by hand. The ingenuity used to solve certain problems are evident in the tools, and the toolmarks show how things were accomplished. I'd enjoy hearing whether there are any others interested in this particular offshoot of the engraver's art. I beleive you heat treated a sword blade for me years and years ago. Yep, that sounds familiar. That furnace is still running, but mostly I load it with dies now, or stainless pipes full of punched coin blanks for annealing. Thanks for the welcome... looks like there's a lot of interesting things going on here! So Ray... have you ever tried engraving on dies? Hi Tom, I would very much be interested in this. So far, I have only done two "dies" for coat of arms embossing. The coat of arms I engrave on signet rings is somewhat similar, i guess? Anyway, welcome! i would love to learn about this. This summers project for me is to put together a coining press. I have not done any dies. I have carved a few Hobo nickels but I have not done any coin or medallion dies. Sounds interesting though. Count me in. I definitely want to learn more about engraving coin dies. Want to learn all aspects from die material selection, to engraving techniques to heat treating the die to stand up to coining. I guess what I'm trying to say is that old presses are cheap if you look around. I bought a couple of mine at prices just barely over what it would have brought as melt-scrap. There are a lot of these things kicking around machinery warehouses. The old ones don't meet OSHA safety standards, so can't be used in modern shops... so they are CHEAP! The best book I've found is THE ART AND CRAFT OF COINMAKING by Denis Cooper, 1988, Spink and Sons, London. It would be interesting to see some of the antique dies and hubs. The best place to start is the book I just referenced. It's a good general intro but does not get into some of the nitty-gritty like steel selection etc. The best steel is D-2. Coin dies is what it was designed for, and it's still the steel that the US mint uses for all their dies. The downside is that it's expensive and rather a pain to heat-treat. A-2 is a good intermediate... O-1 is the next on the scale, and then finally the W-1. Frankly, for most of what I do I use plain old water hardening tool steel. The main reason is because it's cheap and you can get a good hardening without messing up the engraving... because of course you do all the engraving and other die work before heat-treating. I only use the higher grade steels for critical dies that have to last a long time or which have some sort of unusual features that require extra strength. The second thing is to choose the diameter of the steel. You will need die-holders that mount to your press to align the dies for striking... if you make your dies random sizes you'll need lots of holders. You can't buy them and they are a pain to make... so you standardize. I have settled on two sizes... 2.00" round stock for the bigger coins (quarter size to dollar size) and 1.25" round for smaller coins (dime to penny size). Those are standard sizes available as precision-ground stock from many dealers. When I job out die engraving I will usually supply the die blank, which is turned on a lathe with a flat base and flat top, sometimes necked down, sometimes with a hobbed image in the center, and sometime already rimmed on the lathe. That leaves the "field" for the engraver to work with. Hobbing is perhaps the most misunderstood aspect of traditional diesinking. For that reason it has been my especial study, even moreso than engraving. (because I know there are lots of people who know engraving and I can learn it whenever I want, but the number of people who know hobbing is fewer every day). The idea is that, counter to intuition, annealed tool will flow like soft copper IF YOU PUSH ON IT HARD ENOUGH. So you can make a design in the positive, and PRESS it into the annealed tool steel blank to make and impression. Then you turn down the face, bring the (now distorted) die blank back to cylindrical, and add other design features. The detail that is possible is really quite incredible with this techique. It is safe to say that the majority of old-time die engravers spent much more time working on master hubs (which would then be used to press out dies) than they did working directly on the dies in the negative. retraction compressor for the piston. I did have my eye on a 20 ton Fly Press, but the thing is 2000 pounds and is in New York. I don't known exactly what I could tell the border guards about this one. Maybe it was a lawn ornament for my wife garden? Okay... that rail sounds like it will be stout enough if you can get a good deep weld. 50 tons is a lot of force. I have been totally amazed by things that can happen when a lot of force is applied! I must admit that my dear wife has been very patient and tolerant of my equipment obsessions. I think that she feels it keeps me out of the bars. And of course she really likes it when people buy stuff I make... women like money. I just have to be sure to explain how great it was that I was able to buy that press last year because just look at this order that came in! Diplomacy! I wasn't kidding when I mentioned several thousands. I was able to purchase the entire tooling collection of handmade master hubs from a firm that operated from the 1920s to the 1990s... over 5000 pieces. There are so many pieces that I am struggling just to try to categorize them in boxes so that I can find "that one" again when I want it. Basically when a new job came in... say... a medal for a horse show... the engraver would make a hub in the positive of the horse, then press it into the die blank, and then add text and other features. The hub would go into the archive and become available for use if a similar project ever came up. But now that all this sort of work is jobbed out to China or Taiwan, it's all done by computer controlled machining... the modeling work tends to look "flat" and the tooling marks usually show. Nobody cares anymore. These tooling collections are hitting the scrapyard sometimes. I could show some pics... but there is SO MUCH. I would love to do a database catalog with linked pictures... but the time it would take! I will try to get some pics of a few hubs, and their matching dies, and the coins made from those dies so that you'll get the idea of how it works. This is very interesting. I'd like to give a go at making some coins or similar myself some time. I am definitely interested in this thread. I am just learning hand engraving. I have some very limited experience in making some simple coining dies a few years ago. I built my own 50 ton press and will post some pictures of it when I get a chance. Ah... good question. This is a key to the whole thing! You absolutely do need to scrupulously protect your hard work from the ravages of the furnace! I use a powdered heat-treating compound from Brownells. You heat the die to about 600 degrees or so (dark stray to purple) then sprinkle this powder all over the worked surface... indeed, all over the entire thing. The powder melts and runs and forms an airtight seal over the critical parts. Then you heat it up to the hardening temperature and when you quench it, the compound basically explodes off the surface, and you have a pristine and clean... but glassy hard die! The basic compound works for steels that harden up to 1650... i.e. oil and water hardening steels. For the air hardening steels you need to wrap them in stainless foil in the furnace... which is such a pain in the patoot that I avoid it like the plague. Okay Gail. Here is a drawer of handcarved master hubs. This is a very small subset of my collection but hold some that I have actually used to make dies. The hubs are hardened tool steel and are handmade by engravers. Some of them show very small "SP" initials in the flat field. Those are creations by one of the great masters of this genre, Stan Pearson, who worked in the Kansas City area from the 1940s to the 1990s. This is a closer view, focusing on one particular hub of a miner in turn of the century garb with a pick. Here is the obverse side of the bullion coin created using that die... one full troy ounce of pure copper. I did the coin in celebration of the Copper Country of Michigan's Upper Peninsula. It is currently for sale in a number of gift shops around that area. It takes about 150 tons of force to get full strike-up on this coin. Here's the same coin shown on edge, to show how the collar forms the smooth edge of the coin and helps the rim get pushed up. Here is an example of a master engraver's work being replicated so that many people can enjoy it. Even if the die breaks (which happens far more often that you might think) it can be re-created by using the archived hub. Thanks for taking to time to post these great pics! The art work exhibited there is mind boggling when you stop to think it was all done by hand, as an every day job. Looks like it would be fun to to visit that shop of yours sometime. Of course it's possible to engrave dies directly... and many are done that way. The problem comes when you are trying to model a specific form... such as an animal or a human face. Doing this in the negative is very awkward. This explains why many medieval coins have such stilted portraits on them. Thehobbing technique allows the engraving work to be done in the positive, where it makes more visual "sense", then transferred in the negative to the die, where it can be further embellished. Here is a photo of a hub I made myself. It's carved into the end of a 3/4" diameter rod of O-1 tool steel. Here is the die that was made using the hub, then adding a rim using a second hub, and finally hand engraving runic letters and a surface for the raven to stand on. Remember that all lettering must be in reverse!!! After this photo was taken it was remounted and centered on the lathe and the final rim turned into the die. In case you're wondering what the runes say... it is ROAC CARCSSON FA4. Which commemorates the King of Ravens Roac Son of Carc in a coin issued by Bard The Dragonslayer in the fourth year of the fourth age of Middle Earth. The coin is small... about dime-size in diamter but thicker... weighing about 5-grams of sterling silver. I call it a Raven Disme of New Dale. Striking force to make a coin of this size is about 30 to 40 tons. Okay... well... I guess this thread is not going to win any prizes. I'm a bit surprised since I had thought there would be a lot more interest in this topic here. 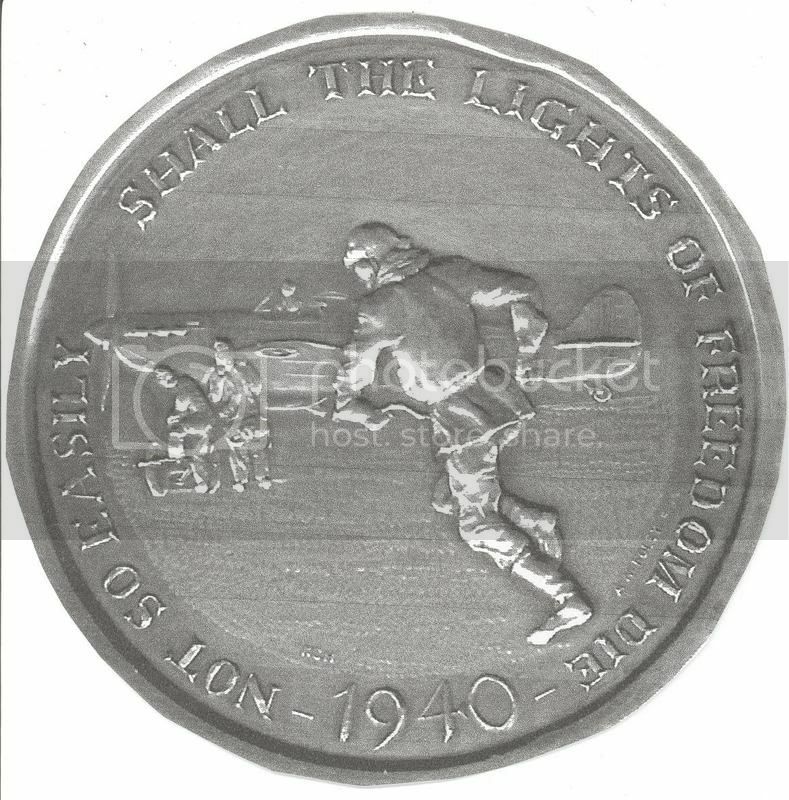 Even if one is not interested in coins or medals per-se, it should be obvious that an engraver could cut dies for a token promoting their own engraving service... a sort of metallic business card... that would embody an actual example of the engraver's work. Many such engraver's tokens of the 1800s and early 1900s are known to token collectors. Since there is something of a resurgence in engraving it might be time to bring back that tradition. I am in agreeance with you, I like the idea of a token to promote ones work and may pusue that idea do you have examples of these tokens that you could post. By the way really enjoyed you swords years ago, being a cutler is hard work but it gets under your skin doesnt it. month and I've always wanted to try explosive forming with a sheet of copper. I wait till the corn cribs are going through village. Nobody will notice. thing. You may not win the big prize, but this thread is a winner. I think there is interest, but the prospect of building or buying a coining press is pretty imtimidating for some of us. Are there any "lower tech" methods that may get us able to strike some kind of image, to make a sample like you suggest? Or are some of the metal forming presses out there capable of some of this type of work? Do you offer services for those who may be able to do part of the work, but not the parts that require the press? I have thought that this has been a very good thread. Hi Tom, I think there is interest, but the prospect of building or buying a coining press is pretty imtimidating for some of us. Are there any "lower tech" methods that may get us able to strike some kind of image, to make a sample like you suggest? Or are some of the metal forming presses out there capable of some of this type of work? Do you offer services for those who may be able to do part of the work, but not the parts that require the press? I have thought that this has been a very good thread. Ah! Yes of course. I have a shopful of presses, but the die-generation is always the bottleneck in any project. I often job out the die work for particular projects. Typically I would ship annealed tool-steel die-blanx to the engraver that have already been turned, faced, and necked... sometimes with rims already cut and sometimes with certain design elements already hobbed in place. I can also do the actual pressing of coins/tokens etc from dies that you engrave. Either I would send you the steel blank or I'd need to provide detailed specs so that your die could be accommodated in my press tooling. I have a 3hp 5 inch rolling mill for reducing plate, and a multitude of blanking punches for creating blanks... both round and in various shapes. Here is a website of Joel Anderson's, where he is selling some fantasy coins I made, on dies engraved by Greg Franck-Weiby... one in 5th century Roman style, and the other in 10th century Viking style. Many people would like tokens made to advertise their shops or services... but getting good dies engraved is difficult. Frankly, I'm a beginning engraver and the dies I make myself look pretty amateurish. That works fine if the STYLE of the piece is intended to evoke medieval coins, because the originals were pretty crude and the overall effect works. But if the work is intended to be more modern in style I generally try to hand off to someone with more refined skills. I have made several sets of dies over the last couple of years and as long as I stuck with pewter I can 'press' up to one inch with a 20 ton press and hand strike 3/4 inch with a large hammer. Now that I think about it, I have a GREAT book on the subject - Numismatic Forgery. Its written in a "Now I don't condone this, but if you wanted to make coins..." manner and shows a number of ways to make dies and strike coins either by hand or with a small homemade drop hammer, both with and without a collar. I bought it at the A.N.A. in Colorado Springs, but should be available elsewhere. By the way Tom, did you ever find a use for the letter punches I made for you a few years ago? Yes I was able to do a couple projects with those punches. It really drove home the lesson that small letter punches are the very devil to make! Sounds like that book you mention is one I need to get. I mentioned Cooper's book earlier... also very very good. Hi Dingo... Ah... somebody who remembers the swords! Thanks for the comments! I have not made any in some years... this whole coining thing has sort of taken my shop over now. I did make a knife in 2006 and two in 2007. Perhaps I'll even do another one in 2008... but it's just as a side thing. What got under my skin was the grinding dust and the buffing compound. Coining seems a bit cleaner by comparison... though I end up dealing with lots of heavy greased bearings, chain hoists, and bags of hot lathe chips. I borrowed Cooper's book from the ANA a couple of years ago and you're right, its a great book. I wish they would reprint it as it has gotten quite expensive on the secondary market. Numismatic Forgery is written by Charles M. Larson and the ISBN number is 0-9742371-2-4 and I believe list was $19.95. Its one of the few books I have read more than once. Who knew you could make a die with a shotgun? I just checked Amazon and used starts at $6.49 Not too bad. There's a bunch on ebay... I just snagged one for ten bucks. Sounds interesting! Cooper is almost a textbook treatment. I have written to the publisher about reprinting, but they don't reply. I'm halfway thinking of just scanning the whole thing. It's too valuable a resource to have it die. It is not my specialty but I have engraved several dies for a jeweler who was making hunt buttons. I have never used a master hub to press in the die. I engraved directly the motif in the metal, in reverse. It's true that it is awkward to do that way. I know that easier processes exist but a hand- engraved die has the advantage of a faster and sometimes a better result in the details. Yes, if the motif can be cut directly into the die then that is often the best solution. It is also possible to engrave fine details (feathers etc) after a hub image has been pressed. Some types of motifs (human faces for example) are easier to work in the positive than in the negative. The images you posted are very fine work indeed! The first picture looks like a hub to me... The lettering is very nicely done. Top-drawer! I have never heard of "hunt buttons" before. How are they used? Here is two views of a much more ordinary vest button that I make. The central image is pressed from a hub and then edited with a graver. The lettering is punched with the letter punches Joe Paonessa made for me. a hunt button is in use in the Venery and Falconry Clubs. It is a typically European tradition. The first image is not a hub but a piece of brass stamped in a die that I have engraved. This piece , after being cut out with the saw and being bent will be used as a model for a rubber molding. This mold is used then to make a series of pieces in wax which will be used to cast several copies in silver according to the method of lost wax and which will be then applied to a gilded button. .... Now that I think about it, I have a GREAT book on the subject - Numismatic Forgery. Its written in a "Now I don't condone this, but if you wanted to make coins..."
I got my copy the other day and have been perusing it. You're right... it's great! There are some super hints there about tricky stuff like cutting the broach for reeding a collar, blank forming, and hobbing. Of course, it's geared towards the criminal aspect of forging coins... but except for the copying aspect, the techniques are all the same as doing original work. I'm wishing I had gotten this earlier... there are a couple tips that would have saved me a lot of time and some mistakes that I had to learn the hard way. Get this book! Just finished reading my copy yesterday - I agree, it's a great book! The info on how to copy an existing coin is interesting, and I can see it being potentially usefull if you're ever called on to make replica coins. From a web search it appears Mr. Larson has been doing some of that in Isreal. He set up for making some very faithful copies, then added his signature to the coin's edge so you can tell they're replicas. Sometime this summer I have to find someone with a machine shop so I can make / help make a press for hammer forging (similar to the one on page 138 but with a few modifications) and then design a token of my own. I have no interest in making replicas... the fine line between "replica" and "fake" is too gray for me... don't even want to go there. But I would like to be able to copy some basic design motifs from existing coins... like the excellent galleon off the back of a British pre-decimal 1/2p, or the eagle on the back of a Washington Quarter... then use them in a different context. I'm far more interested in fantasies and original works. This is a late 18th century design originally run from a steam-driven line shaft and converted to electric drive. The overhead shaft is run by the electric motor. There are two clutch plates mounted on the shaft. The operator moves a lever which shifts the clutch shaft longitudinally, engaging one plate to the screw flywheel through a leather belt and driving it down. When the lever is released the other clutch plate engages, raising the flywheel back up to start position. It's quite ingenious and far more sophisticated that something anybody could conceivably make on their own. Just finished reading my copy yesterday - I agree, it's a great book! The info on how to copy an existing coin is interesting, and I can see it being potentially usefull if you're ever called on to make replica coins. From a web search it appears Mr. Larson has been doing some of that in Isreal. He set up for making some very faithful copies, then added his signature to the coin's edge so you can tell they're replicas. Tom, a small question. Can you tell a rule of thumb, if it exists, for press power and size of coin it is able to make? You said that 30-ton press would be enough to make dime/penny/nickel size coins. Dime is probably about 1/2 inch diameter? (sorry, never seen/user one of those in real life). So, for example, how big press would I need for 3/4" or 1" coins? Or, how much would I be able to do with 50 ton press? This is just excellent thread/info here! Great Question... one I was never able to find an answer to and just had to figure it out by experience. My first press was the 40 ton blue manual press. There is no way to actually measure the force of course, but presumably that represents the maximum available force when you really whang the thing. You can extend the range (that is, use a press for a larger piece) by using multiple strikes. At need you can even do partial strikes, anneal the blanks, and then strike again. (that works for broadstruck pieces without a collar) You can even do some REALLY tricky things by using thin wedges under the dies and "rocking" them into the work under multiple blows. This can be dangerous (I have had peiece of metal fly out at bullet-like speeds) but I've managed to do 600 ton work on a 320 ton press that way. Another thing to consider is "headroom"... that is... if you have a 50 ton press you never actually want to run it at 50 tons since you will be putting a lot of stress on the parts and could actually break the frame if you overdo it. So you use the 50 ton press to do 30 ton jobs, the 150 ton press to do 70 ton jobs, the 320 ton press to do 150 ton jobs etc. If you stay well below the rating of the tool it will last forever. If you routinely push a tool to its limit it will not last very long. Tom, a small question. Can you tell a rule of thumb, if it exists, for press power and size of coin it is able to make? You said that 30-ton press would be enough to make dime/penny/nickel size coins. Dime is probably about 1/2 inch diameter? (sorry, never seen/user one of those in real life). So, for example, how big press would I need for 3/4" or 1" coins? Or, how much would I be able to do with 50 ton press? This is just excellent thread/info here! I'm thinking more of a 'jig' for hammer-struck coins than an actual press - limited space as well as limited funds. Of course I can see myself trying it and liking it, so I'll remember that you have 'extra' presses, just in case I find myself needing one. Does anybody make a unit for hammer-struck work? Something with an upper & lower die holder, collars if you want them, and some sort of lever so you can hold the upper die down while giving the rod a good solid whack? Be nice for folks like myself looking at extremely low volume. I agree with you on the replica business, but some of the techniques you'd use to make a replica could also be used to 'borrow' those design elements you like. I'm pretty sure you'd have to make that jig yourself... never seen anything like it for sale. That was a pretty good design in the "Numismatic Forgery" book... but not the sort of thing that would sell many units ;-) The leverl could be a spring, and actually the hold-down is not really necessary if you use one hand for the hammer and the other on the trussel to keep it from doubling. I think that design was based on the idea of using a two-handed sledge. That's the one I'm thinking of. The reason I'm thinking of adding a hold-down for the lever (probably just a bungee cord) is so I can use a two-handed sledge (splitting maul, acutally) if things decide to be stubborn. If I want to really wham it I can take his advice and add a drop hammer. Should be fine for 'runs' of a couple dozen at a time just to have my own tokens to hand around. For Sale: Zeh & Hahnemann #5 percussion press. Tooling included: Flat hammer face on ram. Transportation: Can help load onto trailer or flatbed. Pics attached below. The press is currently in my shop but not set up and running. I have another one almost exactly like it but slightly larger, a Z&H #7, which is shown on my shop tour page at http://www.shirepost.com/ShopTour.html If anyone has any questions about how it works just ask. The price is for the press as shown... if you want me to make die holders and set it up for a certain operation I could do that, but it would be extra. This press would need to be bolted securely down to a solid foundation (concrete slab preferably) as otherwise it will try to "walk" in operation. Price is current as of posting date... could change if the SHTF or prices of metals change significantly. I've made one of the die holders from the numismatic forgery book and plan on making one of the hold down fixtures when I have tome to do a G job at work. I was thinking of some kind of spring loaded device for holding it while two-hand hammer striking. When I get a new camera I will post some pictures. As I said earlier in the thread, I've also been pondering these. One idea I had is adding a slot across the bottom die holder to let you put a bar under the bottom die. Add a bent handle and you can lift the bottom die up to pop the finished 'coin' out of the collar. Of course if you want to use a set screw to keep the orientation of the bottom die relative to the upper die then you'll need to have a vertical slot for the set screw to ride in (with a slightly larger slot a nut to hold the set screw can ride in). A hold down for the top lever could be as simple as a flat rubber 'bungie' strap running between a pair of eye bolts. Press the handle down, flip the strap over and hook the free end, pick up the sledge and give it a whack, release strap, flip open the top and press down on the eject lever to pop out the 'coin'. They are 4" long, made from 3/4" diameter W1 tool steel, hardened and tempered, with a softer shank to avoid shattering. They're designed for making a 3/8" diameter miniature St Gaudens $20 gold piece by hand hammering, but of course that design could be used on almost anything. A trial strike from the dies in .999 gold is included. By the way, the coining press mentioned a few posts above is still available. Excellent work, Tom. What method did you use for making the dies? I don't suppose you have a Janvier hidden away in your shop, do you? This weekend I'm heading to Colorado Springs to the A.N.A. summer seminar for the Art of Engraving class. This year we will be hand cutting a 3/4 inch die and striking pewter tokens. This is a one week class over two summers and is fully funded by the Gilroy Roberts (former chief engraver of the U.S. mint) foundation. Great fun, everyone should apply for next year's class. If they're going to do it again I certainly want to attend! Nope, no Janvier, at least not yet. (I know of one for sale... just have to convince myself that the purchase price is worth it) These dies were hobbed using original hubs that came from a large eastern private mint that went out of business a few years ago. I used the Gorton pantomill and a hand-graver to add the date and mintmark. Tom I thought you might like to see ythis. The Die was handcut around 1980 by Kenneth C. Hunt in Weybridge, Surrey. The Story is that most of this run was destroyed, some legal problem with bullion laws at the time, and there are only a few examples extent. Hi All, I've attached two pictures, one of the carved coins I have recently done and one of strikes from my latest dies. All of these are going to the summer seminar, the coins to sell and the tokens as little business cards. The lettering was done on my pantograph and the lamp was hammer and chisel carved. The proof effect was done by glass beading the die and careful polishing with 1500 grit paper to shine the surface, which becomes the background on the coin. Tom, the ANA has two seminars, both of which are one week in two consecutive years. One is for die cutting, one is for plate engraving. The plate class is taught by a BEP engraver, the guy who cut the plate for the ten dollar bill. You must send a application for the classes, but if I made it, anyone can. For more information, point your browser to www.money.org and look for the Art of Engraving scholarships. Those are looking great Joe! I guess one of the points I was trying to bring to this board was that if you can do such nice coin carving, you could just as easily carve a steel hub (well okay... steel is a little harder to carve than brass... but not much) which could then be used to hob a die, and then your work would be reproducible instead of being a completely handmade piece. I've done thousands of one-off pieces and honestly I'm getting really tired of it. I like the idea of cottage scale production.